A journey of exploring the 5Rhythms Waves. 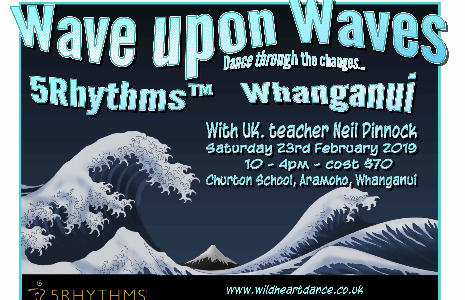 In this workshop we will dance wave upon waves, explore the waves within waves and map the waves of energy that move in our own lives and dance. Big waves, small waves, some with and some without music, some together and others alone. By discovering how we are just energy in motion unfolding into this creative moment of our lives we will uncover gifts to use both on and off the dance floor. Neil hails form the UK and trained 5Rhythms Waves with Gabrielle Roth in 2008 & Heartbeat in 2018. He regularly teaches across the UK and internationally to all ages. His style is passionate and tender, humorous and wise. His musical tastes wide-ranging and well suited to support the many rhythms within rhythms that this workshop requires. Join him for this not to be missed offering in NZ. $70 in advance or on the door.